It was the bags of strange green beans that started it all. Left behind by the Turks following an unsuccessful siege in 1683, the Viennese initially thought they contained camel fodder. However, when roasted and soaked in hot water, the beans produced a magnificent aroma, and a surprisingly stunning taste. Since then the locals have been hooked on Java, with the brew now central to Viennese culture. Today, more than 300 coffeehouses are congenial social centres for both the locals and the many millions of tourists who visit the city annually. The first step to enjoying the coffeehouse is understanding the menu lingo, together with an appreciation of the established traditions. In most coffeehouses there is a choice of some two dozen varieties of the brew. Melange (coffee with steamed milk) - a good substitute for latte - and einspanner (mocha served in a glass with whipped cream) are the most popular. Brauner is the basic drink (coffee with a bit of milk), while the more exotic choices include, turkische, a strong black coffee brewed in a copper pot. Fiaker – mocha with rum or brandy - is served in a glass, while wiener eiskaffe is a concoction of vanilla ice cream with cold mocha and whipped cream. Best not to upset "Herr Ober" (or headwaiter, as every waiter is seemingly called in Austria) by simply asking for "a cup of coffee," and certainly not "instant"! Whatever the selection, the coffee arrives on a small oval tray, accompanied by a glass of water, with a spoon balanced delicately on top. The glass of water symbolizes the establishment's desire to let the patron know they are welcome to stay indefinitely. Some coffeehouses offer chess, cards and even billiards, while all provide a selection of newspapers and journals (some in English). Tourists mingle with businessmen consummating deals, students studying, lovers tete-a-teting, shoppers reviving, matrons gossiping, politicians lobbying and retirees browsing. The surroundings may be sumptuous or simple, humming or hushed, illustrious or insipid, but every café worth its java, cultivates its own individual reputation and character. 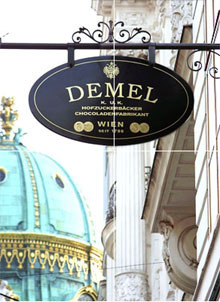 Demel (Kohlmarkt 14), is one of Vienna's most celebrated establishments. Its baroque décor, ornate murals, chandeliers and sugar plum fairy elegance can all seem a bit unctuous. Famous for its Sachertorte (see sidebar), it dispenses delicious, decadent and expensive pastries. It is a shrine to the sweet-toothed, with nusscafetorte (nut and coffee cream cake), and gerollte mandeltorte (rolled layers of meringue, almond, ganache and buttercream), nestling in glass cabinets groaning with latent calories. 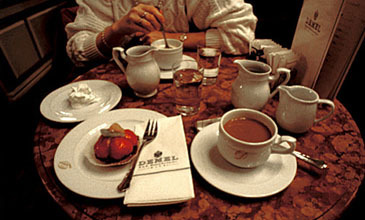 But then Demel specalises in this fare – it is one of the many "konditoreien," or pastry shops, which also happen to serve coffee. To the purist, "konditoreien" are not "real" coffeehouses. 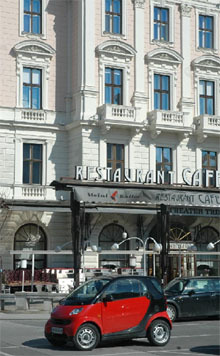 Café Landtmann, (Dr Karl Lueger Ring 4) on splendid Ring Boulevard, is probably the best meeting place in the city. Next door to Vienna's renowned Burgtheatre (Imperial Theatre), it is easy to reach from both inside and outside the city centre. Transformed in 1873 from a chocolate shop, it combines the old and the new to perfection, while reflecting an understated aura of elegance. Here, many receive a "coffeehouse knighthood" for being, not only known by "Herr Ober," but also addressed by name! Landtmann has an interesting a la carte menu, but book ahead to dine between noon and 2 p.m. A house specialty is the legendary Marmorgugelhupf – marble coffee cake. Famous clientele include Sir Laurence Olivier, Marlene Dietrich, Gary Cooper, and Sigmund Freud, who practiced nearby before fleeing to London. Landtmann's location makes it a magnet for many theatrical, political and society figures. Café Central, near historic St. Stephen's Cathedral (Herrengasse 14), is an institution which, at the turn of the twentieth century, counted chess playing Lev Davidovich Bronstein and Vladmir Ilyich Lenin amongst its patrons. A few years later Bronstein (a.k.a. Leon Trotsky), emeshed continental Europe in turmoil. When the Austrian Foreign Minister heard of the 1917 Russian Revolution, he is reported to have commented in amazement, "You are not going to tell me it was that chess playing Bronstein from the Café Central who started it!" During the Lenin – Trotsky era, about 250 newspapers and journals were available at Café Central. While this array of reading matter has somewhat diminished, patrons still have access to a wide choice of foreign and local publications. Renovated during the early 1980s, its vaulted ceilings, Corinthian columns, marble topped tables, grand piano and simple wooden chairs capture an air of refined grandeur. A non-smoking area is reserved to the left of the welcoming Peter Altmann statue. 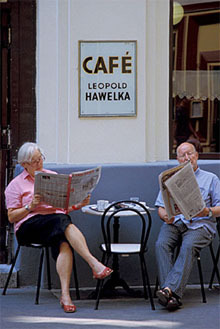 In a narrow alleyway (Dorotheegrasse 6), also in the vacinity of St. Stephen's Cathedral, is the Café Hawelka, which has probably not changed much since it reopened after the Second World War. The sign outside welcomes "Kunstler und Lebenskunstler" (artists and artists of life). Such a salutation has attracted famous painters such as Friedensreich Hundertwasser, who, like many other artists, paid their bills with paintings which still adorn the walls. Owned and operated by Leopold Hawelka and his family, it is the classic kaffeehaus. Intimate, austere, smoky, noisy, dark, with wooden floor and marble topped tables; Hawelka is a bohemian haunt popular with students, intellectuals, actors and artists – probably the most colourful clientele in Vienna. Due to its cramped quarters, it's always crowded – which adds to the atmosphere. Not much in the way of nibbles, but fine coffee lovingly prepared. One of the great pleasures of the Viennese coffeehouse is that, no matter how modest the order, once served the customer can stay as long as they like. "Herr Ober" is in no rush to present the bill. It's so easy to succumb to their allure, and forget about all the other magnificent attractions Vienna has to offer. For gourmets, this is a slice of paradise! A sumptuous chocolate confection infused with thin layers of apricot jam and enclosed in smooth bittersweet velvety chocolate icing. It is usually served with a side dish of schlagobers (whipped cream). 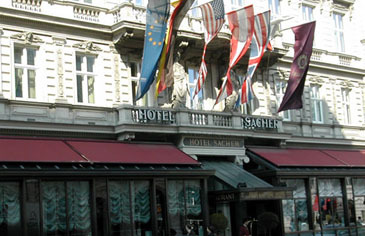 Franz subsequently opened his own establishment – the Hotel Sacher – where his torte, and other delicacies, made him prosperous. 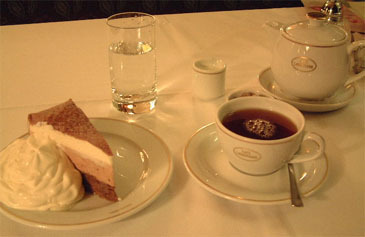 For some unknown reason, his son later sold the recipe for Sachertorte to Demel another leading Viennese pastry shop. This caused ongoing conflict between the two cafes as to which had the right to the name "Sachertorte." In 1962, after a nine year legal battle, the court ruled that the Hotel Sacher could call it's pastry the "original Sachertorte," while Demel was entitled to name it's product the "original Demel Sachertorte."